Motrin Products Recall Information – IMPORTANT! 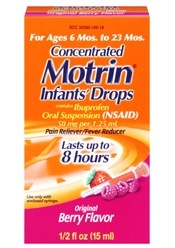 You may have noticed that Concentrated MOTRIN® Infants’ Drops Original Berry Flavor 1/2 fl oz bottles are not readily available where you shop. This is because the makers of the product, McNeil Consumer Healthcare Division of McNEIL-PPC, Inc. (McNeil), has voluntarily recalled three lots of Concentrated MOTRIN® Infants’ Drops Original Berry Flavor 1/2 fl oz bottles from wholesalers and retail stores in the United States. McNeil is asking consumers to stop using and dispose of any product they may have that is included in this recall. 2016 © Commonwealth Pediatrics All Rights Reserved.